The majority's backpacking experience improved exponentially with this ultra-expensive footgear. They particularly thanked the boot’s quality construction and exquisite details for enhancing their overall trekking performance. Several backpackers liked how supportive the Lowa Tibet GTX was. Despite its sturdy look, it required virtually no break-in period, according to many users. The width options were appreciated by a huge percentage of wearers. Regardless of the foot volume, Lowa was still able to meet their needs. A multitude of owners approved its right-out-of-the-box comfort. This Lowa footwear received tons of praises from seasoned gear critics for having unyielding water protection. Professional bloggers confidently called this backpacking boot exceptionally durable. A couple of expert reviewers loathed the default insoles of the Lowa Tibet GTX. They had to replace it with aftermarket insoles to get their best boot experience. Its soles separated from the upper too soon, as mentioned by a low percentage of users. 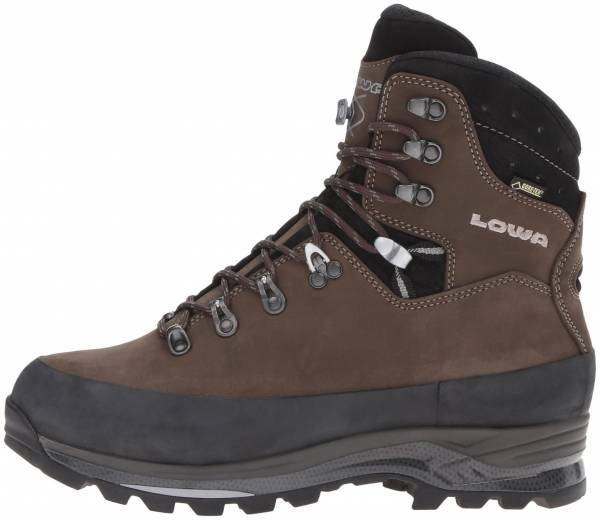 Lowa called the Tibet GTX a workhorse of a boot, and it certainly did the job. Its ultra-expensive price was worth the investment as it enhanced the backpacking experience of users through its well-thought-out construction and superb waterproofing. The support and right-out-of-the-box comfort were also applauded. It did not require an extended period of breaking-in and it was able to meet the needs of Lowa loyalists by offering choices in width. It is not always thumbs up for this backpacking boot. The unsatisfactory default insoles and feeble outsole of the Tibet GTX frustrated users. If you're gonna cover a lot of miles, and you want a boot that's gonna last you a lot of years, consider the Lowa Tibet. It's great for all-season use, but it's particularly great for mid- to late-season use. The Lowa Tibet GTX Boots are a great choice for serious hiking and technical mountain climbing, and you really get your monies worth with the materials and build quality. If you’re looking for a great pair backpacking boots you should definitely check out the Lowa Tibet Pro GTX boots. The Tibet GTX is a boot equipped with a multitude of technologies suitable for backpacking. Its Vibram Masai outsole with Climbing Zone technology is ideal for outdoor activities as it provides support even with a heavy pack. Lowa’s exclusive DuraPU with Supination Pronation Support (SPS) System provides comfort and maintains a controlled rotation of the foot. It helps promote proper gait and stance to prevent injuries. Adding up to the features of this boot are the Climate Control Footbed which helps keep the freshness of the foot and a 5mm, full-length, hard, nylon stabilizer which renders support. Lowa’s Minimal Seams technology, C4-Tongue and X-Lacing with stud work together to prevent chafing and friction. With its nubuck leather reinforced with a high wall rubber rand, it can provide protection and durability. Water protection is handled by the Gore-Tex Performance Comfort liner. Lowa ensures that longer backpacking trips become more enjoyable and comfortable with their fit technologies. Their I-Lock system, 2-Zone-Lacing, FlexFit and a mixture of hooks and eyelets for their lacing hardware all come to play. The Tibet GTX is offered in standard sizes for both men and women. The men’s version comes in medium and wide widths. Lowa has utilized the S and WXL lasts to accommodate a broader range of foot shapes and sizes. The S last has a narrow ball area and suits a lower-volume, narrower forefoot. Alternatively, the WXL last has an expanded toe area that allows for more volume in the instep. To facilitate customization of fit, Lowa included their exclusive 2-Zone-Lacing and I-Lock in the Tibet GTX. 2-Zone-Lacing permits individualized fit on the forefoot and the upper while the I-Lock system, a cam lace loop, is positioned at the top of the foot. It holds the laces firmly to allow wearers customize their shaft lacing. The hook clip can be pushed upwards to release the clamp that loosens the instep lacing. This boot also has open and close hooks, plus additional roller eyelets to get the user's desired fit. Vibram Masai’s large, aggressive lugs are designed for uphill and downhill slopes. Its self-cleaning treads are able to grip on a range of ground conditions. The Climbing Zone under the toes renders support and allows for a more secure footing when scrambling. With Lowa’s signature DuraPU midsole, the Tibet GTX provides shock absorbency and comfort. It is also armored with the Supination Pronation Support (SPS) System. TPU inserts are applied within the softer PU mold to help control the rotation of the foot. This technology prevents overpronation and supination—the causes of fatigue and foot pains. The insole of the Lowa Tibet GTX is called Climate Control Footbed, a breathable top layer. Its foam conforms to the foot's shape for customization. This footbed works with Lowa’s Climate Control System to keep the foot dry and fresh. It also promotes ventilation in and out of the boot. Using a 5mm, full-length, hard, nylon stabilizer as its support, this hiking boot can take on challenging terrains. It also provides torsional stability. Lowa’s Tibet GTX upper is crafted using lightweight nubuck leather. This material is known to be resilient and breathable. When it gets wet, the color of the material darkens. However, this does not affect its durability. As soon as the material dries, it gets back to its original color. Reinforcing and providing protection in the upper is its high wall 360-degree rubber rand. Using the Gore-Tex Performance Comfort membrane, Lowa combines waterproofing, insulation and breathability in this backpacking boot. Its construction allows moisture from the inside to escape while it keeps water outside from seeping in. With its moderate insulation, heat is retained in colder conditions. This design makes this pair suitable for a wide range of outdoor activities. The Tibet GTX also has the C4-Tongue and X-Lacing for its upper. Its C4-Tongue is anatomically contoured to be able to absorb pressure. Its significant features include an asymmetrical padding which gets thick towards the outside of the foot, higher ankle areas inside the shoe than the outside, a notch in the instep for flexibility and a soft padding on top of the tongue. This design increases the walking comfort of the user. The X-Lacing maintains the tongue’s position. It helps eliminate friction while distributing pressure evenly. The patented FlexFit technology of Lowa is also incorporated in this boot. It has a Flex Zone area which promotes easy ankle movements and a flexible Lace Loop for better heel fit. This technology helps maintain the boots’ stability. With all these features, Lowa ensures that the construction of the boot utilizes the least number of seams possible through its Minimal Seams technology. It prevents pressure points and hot spots. The Tibet GTX is resoleable. Lowa resoles the boots at an additional cost using the original materials. However, if they are not available, they choose ones that are at least of the same caliber. In resoling, a new sole replaces the old sole. Vibram Masai outsole is not available for men’s Tibet GTX sizes 15 and 16. Lowa used a different sole unit that has matching qualities with the Masai. Strap-on crampons are compatible with this boot.